Now that the Discovery is safely back on the launch pad, we had a chance to turn our attention to the other two orbiters that are still being prepared for their launches later this year. 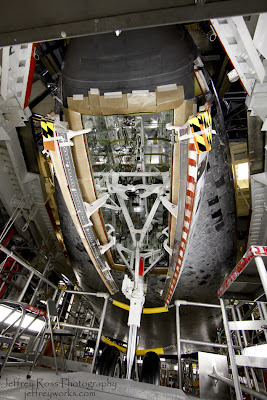 The very last shuttle that will lift-off into space will be the Atlantis. Right now it is sitting in the Orbital Processing Facility, which is kind of like the Jiffy-Lube for Shuttles. It's where all the repair work is done. We have a couple of 3-D camera rigs mounted in different spots here, catching all the action as the engineers and technicians work on the shuttle. While Bob and Rhonda were switching out the batteries and memory cards of the 3-D rigs, I though I'd get a few photos to show you some behind-the-scenes hard work that the public almost never get to see. 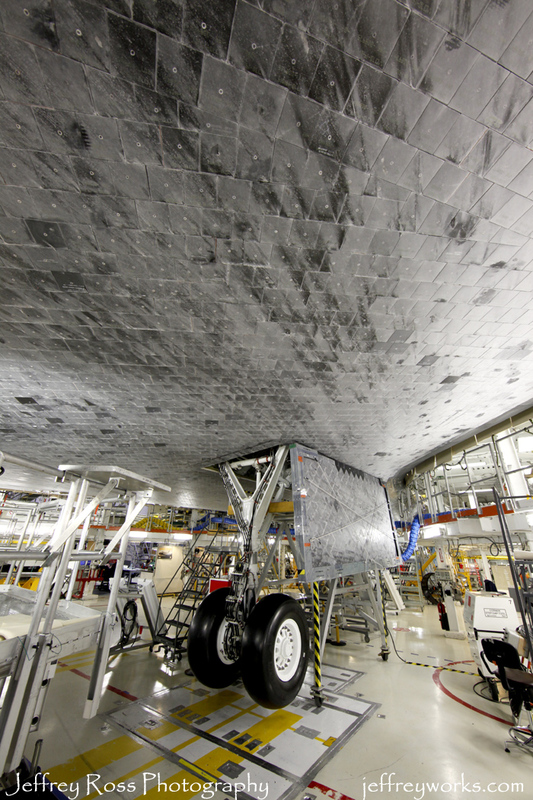 The above photo really demonstrates how covered up the shuttle is during processing. It's a little difficult to tell what is going on here, but you're looking diagonally from the front to the rear of the shuttle. 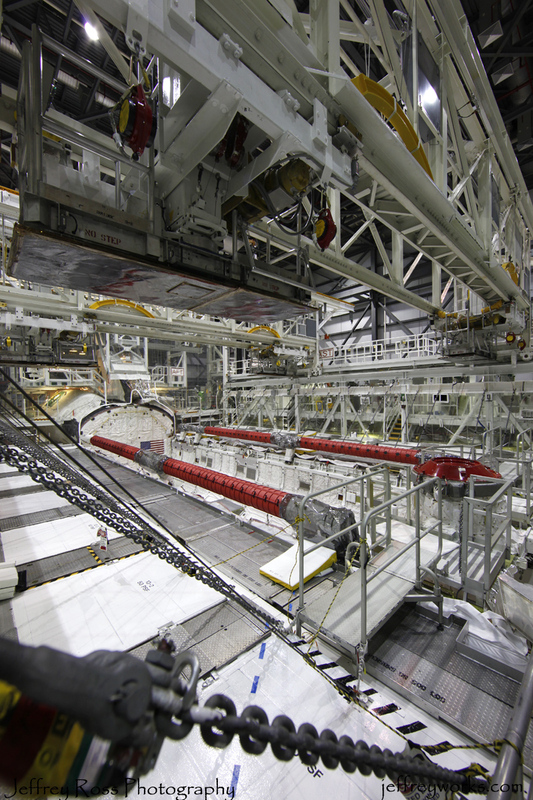 Right in the middle is the cargo bay, surrounded by platforms, scaffolding, and walkways. The overhead rig is actually movable; it slides from the front to the rear of the orbiter. 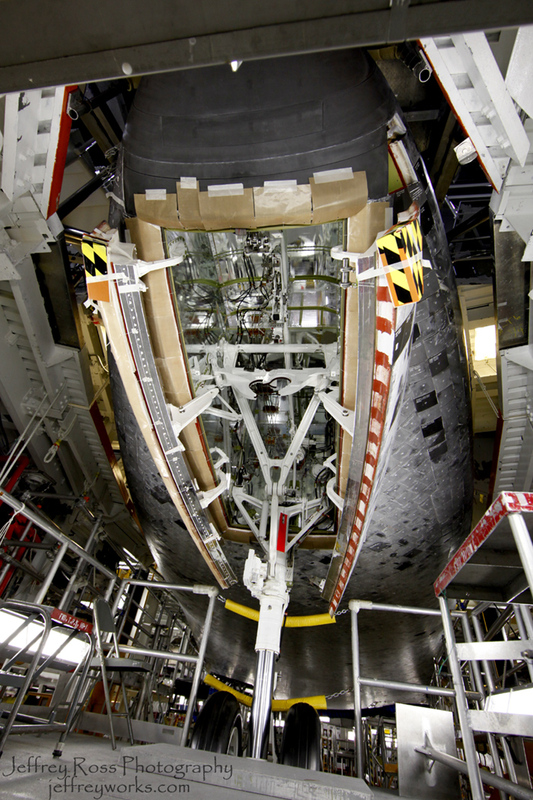 This is the front landing gear right under the nose section. And here is the landing gear on the rear of the plane, under the right wing. This is looking from the rear of the Atlantis to the front. I was using a 14mm super-wide lens to really show off all the burn marks from re-entry. You can also see all the raised scaffolding that is still in place so the technicians can attend to issues under the Shuttle's tiles. Memang Obat Aborsi ini jalan satu satunya untuk Cara Menggugurkan Kandungan selain dari operasi, suntik maupun pergi ke klinik specialis penggugur kandungan yang banyak beredar di internet itu. Your galaxy project report is well prepared by you and I think according to his report I a just saying your project is well and good for the user and support many function for normal user.